There are two keys to the paradigm shift, which may be labeled: “Solar System Space Settlement” and “CANB Technologies.” These keys reduce the difficulty of interstellar space settlement by many orders of magnitude. The first key was discussed in my Winter 2013 Ad Astra column (Interstellar Space Settlement). The large-scale construction of O’Neill space settlements from asteroidal/commentary and other resources in the Solar System creates a knowledge base that can be used to build settlements from the asteroidal/commentary (and more) resources in other stellar systems. Since almost all stellar systems are thought to contain such materials, the distance to the nearest viable location for an interstellar settlement is probably dramatically less than the distance to the nearest (likely rare) Earth-like planet. Indeed, recent observations suggest that the stellar system nearest to ours, the Centauri System, contains at least one (very non-Earth-like) planet. If confirmed, this implies with near certainty the existence of Centauri asteroidal/commentary resources. When contemplating the possibility of interstellar space settlement at a future date (say 100 years from now), what counts is the mix of technologies that exist at the future date, not the mix of technologies that exist currently. Certain relevant technologies are improving much faster than others. In particular, computers, artificial intelligence, nanotechnology, and bioengineering (CANB technologies) are improving dramatically faster than propulsion technology. This suggests that the technology base of the of the future (what you have to work with before investing serious resources in developing technology specifically aimed at interstellar settlement) will have vastly improved CANB technologies and modestly improved propulsion technology. Not taking this sufficiently into account is a frequent mistake. CANB technologies, the second key, can radically reduce starship mass. As any aerospace engineer will tell you, other things being equal, low mass is of fundamental importance to reducing the difficulty and cost of a mission. A (100 year into the future) colonization starship need not carry humans. Instead consider a cargo of intelligent, self-replicating nanites plus frozen human sperm and eggs. Nanites are incredibly small robots built via nano technology from nano-sized (one ten-millionth of an inch) components. When the starship reaches its destination, the nanites use the new stellar system’s asteroidal/ commentary (etc.) materials to greatly expand in numbers and then build an industrial base plus a settlement for humans. Once this is accomplished the sperm are used to artificially inseminate the human eggs (a well understood current technology). Children are born and raised to become the first settlers. More aggressive assumptions concerning future CANB technologies allow mass to be reduced further. Perhaps we could replace human sperm and eggs with much less massive human DNA. Mass could be further reduced, if we could replace the DNA with instructions about how our nanites can manufacture human DNA. 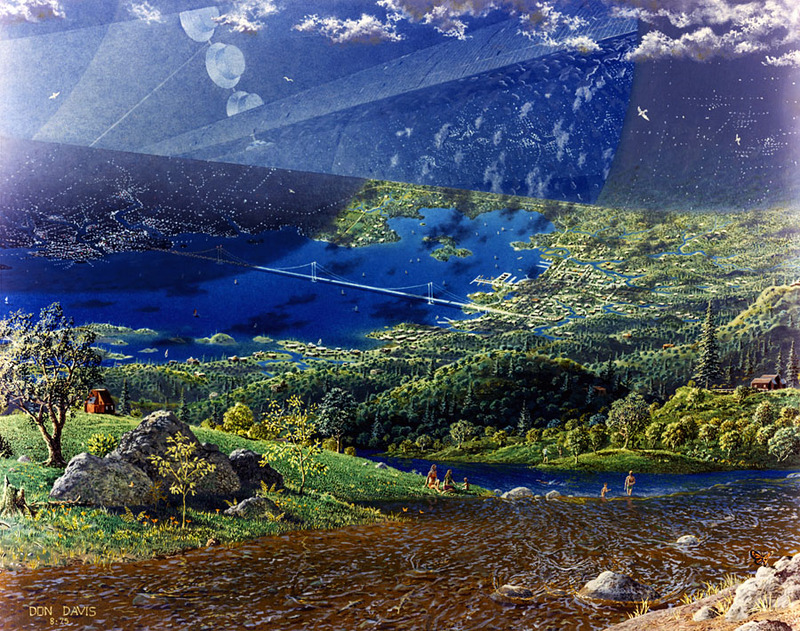 This graphic art portrays an O’Neill space settlement, which might be built in orbit about almost any star. Many experts have argued that within the next century, the minds of humans can be uploaded (transferred) to computers. If true, then an alternative approach may be feasible. We send a cargo of nanites and humans stored electronically in the starship’s computer. After the nanites produce an industrial base and settlement at our destination, they build human bodies to which the minds are transferred resulting in our first settlers. CANB technologies may allow colonization starships with less than a gram of cargo to be built. This, along with the first key, solar system space settlement, reduce the difficulty of interstellar space settlement to the point that we have a paradigm shift. Mark Hopkins is the chair of the executive committee of the National Space Society. This article originally appeared in Ad Astra, Spring 2014.